We would like to thank those in our community who produce and organise all the events that enhance our lives and the time spent here by our visitors. Make sure you visit our Tofino Whale Festival calendar for events during the Clayoquot Festival of Oysters & the Sea, the calendar for the Tofino Oyster Festival, the program information for Tofino Art in the Gardens Festival, and the Tofino Concert listings for the Month of April 2008. Mats available. Phone (250) 725-8363 for more info. Come join us for fun drop-in art time at the Community Hall. Get creative on Winter's rainy days. Children must be accompanied by an adult. May be a small supply fee for some projects from time to time. For more info call Annie Jacques at 726-5488. A drop-in program for parents/caregivers and their children in order to let off some steam! Caregivers must supervise their own children. Free! Leah Austin instructs this low impact, cardio exercise. Open to provide lunch for anyone who needs a good meal. Please contact Jenn for more info at thetis492@gmail.com or call 725-3701. Here is a great opportunity for Parents and Tots to get out and socialise with other parents & tots to burn off some energy. Children must have an adult to accompany them. Volunteers are needed, contact April @ 725-3229. Moms and Dads will be practicing sun salutations, standing poses, forward bends, backbends and maybe even inversions! Basic yoga knowledge will be helpful but is not necessary. Your kids will use you as a living jungle gym; be prepared to become a tugboat, a starfish, a horse. Children should be 1-4 yrs. (child must be walking) Pre-register at 725-3229. This Stretch/Tai-Chi class is geared for seniors with different levels of fitness. Call 725-4286 or 725-4201 for information. Mats available. Please call 725-8363 for more info. This is an opportunity for Tofino's youth to hang out in a drug and alcohol free enviroment. Come and play a fun game with your friends and learn new skills! Helmet and plastic blade hockey stick mandatory (sticks provided). Shoot some hoops, hang out in the mezzanine with pool table, foosball, TV, couches... snacks! No program when school is hosting special events in gymnasium/mezzanine. Roman Catholic Mass at 400 Block Main St. Lust, Caution, Set WWII-era Shanghai, a beautiful young woman gets involved with a very powerful political figure. From the director of "Brokeback Mountain". Nominated for over 30 awards worldwide! A 6 week course designed for beginners interested in building the skills and knowledge to construct simple pottery forms. Fee includes glazes and firing. For more information or to enroll call Daniela at 725-2297. Nutrition drop in with a dietician. Sorting through the health and unhealthy fats. The highly successful Gold Rush Music Hall Revue celebrates the traditions of BC's Music Halls that were so popular during the gold rush. Music Hall Revue features song, dance, comedic sketches and dramatic storytelling in the old vaudeville style. Tickets are $15 in advance, $18 at the door and can be purchased at Wild Heather Books in Ucluelet and in Tofino at Beaches Grocery, Mermaid Tales Bookshop, Storm Light Outfitters or by phone at 725-2533. Fifty per cent of the evening's proceeds benefit the First Nations Youth Photography Club. Come explore one of the jewels of Clayoquot Sound, the Tofino Mudflats. We'll explore the forest fringe and learn about the mudflats and all the creatures large and small that depend on them...and maybe get a chance to look in the mud! Meet at the entrance to the Tofino Botanical Gardens. Deep Blue, Written by David Attenborough, who also wrote "Planet Earth" and "Blue Planet", this film is an epic underwater exploration into the secret lives of sea creatures. You'll be led on a fascinating voyage through awesome aquatic realms where humans have rarely dared to go. In support of the Pacific Rim Whale Festival! This weeks workshop is on developmental scrap booking, make your own infant growth chart to take home. Gone Baby Gone, When two private detectives (Casey Affleck, Michelle Monaghan,) are hired to take a closer look into the disappearance of a little girl, they soon unravel a multitude of twists and turns where nothing is what it seems. Ultimately they must risk everything -- their relationship, their sanity, and even their lives -- to find her. God Grew Tired of Us, In the late 1980s, 27,000 Sudanese "lost boys"-some just toddlers-marched barefoot over thousands of miles of barren desert, seeking safe haven from the brutal civil war raging in their homeland. This award-winning film profiles three boys who embark on a journey to America after years of wandering Sub-Saharan Africa. Tofino events calendar for April 2008. 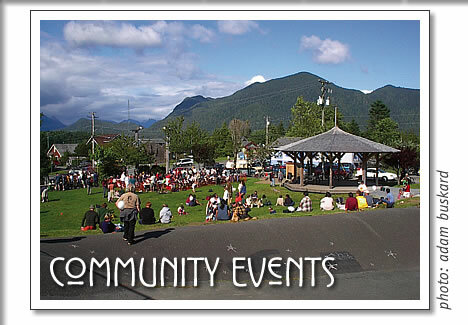 Listings of entertainment and community events in Tofino, Ucluelet and the Pacific Rim National Park Reserve. Go to the Tofino events page for current Tofino event listings.